If you write fiction, you may know all too well the feeling you get once you finish a chapter, a story, or a first draft. There’s a compulsion to share, and to hear what others think of this thing you’ve created from your own genius brain. But, it can be a lot to ask of your friends and family, and even the most willing of readers might not have the time to get a critique back to you as quickly as they (or you) would like. Luckily, there’s a whole host of online resources for writers to share work, and to pay it forward by critiquing the work of others. Some critique communities are even free to join and participate. However, with the resources below, it’s expected that you give feedback just as often as you seek it. Be prepared to make a time commitment! This resource has been around for 20 years, which is notable, considering the Internet isn’t much older. Within a week of submitting their science fiction, fantasy, or horror pieces of maximum 20,000, writers receive 15-20 critiques. The site encourages new writers to learn not only from the feedback they get, but to learn from the process of giving critiques, as well. Ladies Who Critique will help you find a writing partner, free of charge. All levels are encouraged to join, and the group isn’t limited to women. Search for a partner by genre or experience level and send a message if you find someone who sounds great. “Think of it like a dating website, but ‘The One’ is your perfect critique partner,” suggests the site. To start, check out the Writers Coffee Shop forum for posts by those looking for partnership. The group’s blog is not up to date, but its archives contain author interviews, querying advice, and more. This site may look a little old-school, but it’s full of great resources. Here, members can upload their short stories or novel excerpts, and another user is randomly assigned to read it. Once your piece has five reviews from users, it enters the site’s chart system. The site states that collective feedback provides writers with a diverse overview of what’s working — and maybe not working — in their pieces. Membership is free, as You Write On is sponsored by Arts Council England. This Brooklyn-based site is big on facilitating the formation of writing groups. Through Inked Voices, users can search through groups looking for new members during a free two-week trial. If you find one you’re interested in, you can reach out to that group’s leader to join. After you’re linked up with a partner or group, users who pay a membership fee can privately share work and offer critiques. Inked Voices also offers many online resources, a forum for users to ask questions, and audio lectures on writing. While no free version is available, those who choose Inked In can either pay $10 per month or a flat fee of $75 for one year of membership. If you already have folks in your network who are willing to read and critique your work, Critique It might help you share it with them. This tool, like Google Docs, lets readers leave comments and allows multiple users to collaborate on the same item. But unlike Google Docs, it also allows audio and video feedback as well as multiple file formats. “Drag and drop images, video, text and audio files into Critique It and use the same tools to provide and review feedback — regardless of type,” the site boasts. It isn’t a sharing site in the same sense that most of these others are, but it’s a tool that could be used to facilitate sharing with writers you meet online. It appears to be popular with academics, too. This might be the site most writers have at least heard of: Not only does Scribophile offer writers the chance to get detailed feedback on their work, but it also offers a bunch of free resources like free tutorials and a members-only forum. Its writing academy section tells new writers how to format a manuscript, and sheds light on commonly-made screenplay mistakes. A free account allows writers to post up to two works of up to 3,000 words at a time, while a paid version has no such limit ($65 per year, or $9 per month). Critique Circle has been helping writers since 2003. Depending on how active the site is, you may have to wait a week or two for your work to be posted — only a certain number of stories are shared each week. Once a piece is listed, members can read it and send the author feedback during a window of one week. Writers on the site earn credits for submitting critiques, and credits in turn help them get their own work listed. Stories of any genre, up to 5,000 words, are welcome. Poetry may not be submitted but may be posted for feedback in Critique Circle’s forums. There are two levels of membership: The premium level costs $10 per month and offers users access to their own story queue and forum, full access to online tools, and more. Signing up for one or two years can bring your membership cost down to about $3 per month. A premium gold membership available for one or two years, breaks down to about $7 per month. These users receive all premium benefits but also enjoy an ad-free version of the site, access to additional readers, and an unlimited messages inbox. Here’s a bonus: Absolute Write is a forum for writers. Although it doesn’t offer a formal critique program, you’re likely to meet some interesting writers who are willing to partner with you. The forum is very active, so if you post there, you’re likely to get several responses quickly. No matter where you choose to share your work, it’s always best to keep in mind the golden rule of the internet (and, you know, of life): Treat others the way you’d have them treat you. Not everything you read is going to be 100 percent up your alley, or to the level of craftsmanship you prefer. However, it’s crucial to keep your criticism constructive, not destructive. For more critique resources, check out our list of 40 places to find a criqitue partner. Where do you go to get feedback on your work? 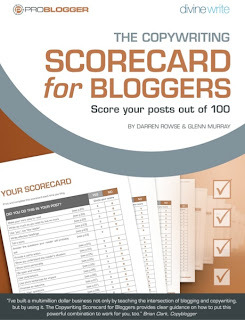 This ebook by Darren Rowse provides a list of recommendations to follow, as well as pitfalls to avoid, as you write that next blog post. I had no idea websites like these existed.This will prove helpful as I am always asking friends and family to critique my work. It’s time to have different pairs of eyes to look over what I’ve written. Thank you for posting this list. This is a great resource. I have been looking for a critique partner (scifi/historical/romance) and had no idea where to begin. You have giving me a wonderful starting place. Thank you! If you check out the websites and still can’t find a critique parterner, I recommend trying to join a writing club. Nice list. I’ve always liked Scribophile personally. It’s also got a nice forum for connecting with other writers. I second Absolute Write as an amazing resource. In addition to finding beta readers, it has a very strong, passionate community. The information and advice in their forums is like striking gold. You’ll find seasoned professionals for every genre and type of writing and publishing, as well as those with less experience. Thanks for the rest of the list! There are some here I haven’t seen that I’ll need to check out. Had great feedback from Critique Circle and recommend it. You do run into people who are critiquing outside of their genre and don’t understand but critique anyway for the points. You learn from all, even those who don’t understand the genre. I’ve decided to try Codex Writers, not mentioned above. It’s a tighter group, with entrance criteria you have to read and follow. It concentrates on speculative fiction, so that’s what I’m trying to focus on. So, I don’t want to sound like a total noob here, but how do these sites work as far as keeping your work your own? I doubt other writers who are interested in critiques of their own work would ever want to take your story and rewrite it as their own, but are your stories protected as soon as they are written? I think these are great resources, and now that I’m just getting back into the writing game, it would be great to have a like-minded creative critique my work so I can get useful feedback. With friends and family, it’s usually a generic “I liked it” or “it’s pretty good,” which rarely allows me to improve my writing. I just want to know a little more about the copyright sort of issues that may present itself with this. Now, I don’t know anything about how that works. I’ve always kept my work to myself and a few close friends and family, but have yet to share anything on the internet. I read each and every one on the list your made, I have a question. This list seems to be for fiction and story telling writing. Maybe at sometime you could put together a list for those of us who write white papers, ebooks, do ghost writing for CEOs and Presidents of Fortune 500 companies, etc. I would really like to find a couple of groups that would offer constructive criticism on the types of writing I mentioned. If you’re still interested in a group like this for business writers, send me a note. I’m the founder of Inked Voices, mentioned above. Inked Voices is fundamentally a workshopping platform, meaning that any kind of writer can use it. I would love to help you put together a group for people who write copy, white papers, long form blog posts, etc. My email is my first name at inkedvoices.com. I love Ladies Who Critique! I’ve found a few critique partners (and good friends) there in the past. I’ve also had success in CampNaNoWriMo (more than normal NaNoWriMo). You are placed in “cabins” (sort of like Facebook groups) with about 12 other writers (you can specify if you want them to be your same age, genre, etc). Some years I have fabulous cabin mates, and we keep in touch/exchange excerpts for a long time after the month is over. I need critique partners. How does this work? I am concerned about copyright issues. Please help me understand.